What’s Good Enough to Eat? They’re everywhere – diet programs, weightloss systems, food philosophies, miracles promised if you take certain nutritional products. There are just about as many opinions on what a human being should consume as there are “experts” on the subject! Books, TV doctors, websites, blogs, health gurus, traveling side shows, official government recommendations . . . and food advice involved with social/political/economic issues. This truly concerned me and I joined for $10. 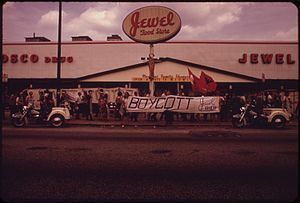 This was my first interest in a social cause and I continued paying for this membership for several years with my own allowance. And of course, I did not eat grapes. As I grew up my personal lineup of diet and health advice came from my mom and Soupy Sales (“Don’t forget your vitaminnies!”), Jack LaLanne, then Adelle Davis, next came the book, “Sugar Blues” by William Dufty, closely followed by George Ohsawa who coined the term “macrobiotics” and Michio Kushi who really brought this philosophy to life for me, and recently Dr. Robert Cohen and his research. I have experienced being a meat-eater, a vegetarian, and a vegan over the years. And what did I learn? I learned that there are some very basic concepts that should be put in place before you can even begin to know what foods work for you. They seem obvious to me now, but they weren’t at first and apparently they aren’t obvious to everyone else either. The first concept is that you have to eat real food. 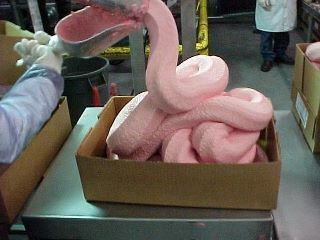 A friend of mine sent out a photo the other day taken by Deb Mahan showing a fast-food factory producing what looks like a pink, styrofoamy boa constrictor of foodstuff and asking you to guess what kind of food it is. (I find the cardboard boxes with no other wrapping disturbing.) Anyway, it’s pretty easy to tell this is not real food. What about all those ingredients on so-called “food” packages that are mostly unpronounceable and that we mostly don’t have a clue what they are? They aren’t real food, that’s for sure. I think you get the point. Real food is not made of plastic, petroleum or chemistry-lab products. The second basic concept is that once you have chosen to eat a real food, you need to look at how refined or processed it is–i.e. how much has the original food been altered? Most people know that refined white sugar is nothing like the original sugar cane plant. Maybe you’ve heard that “carbs are bad.” Well, that depends. Are we talking about refined white flour products in which the flour bears no resemblance whatsoever to the original fields of waiving grain? 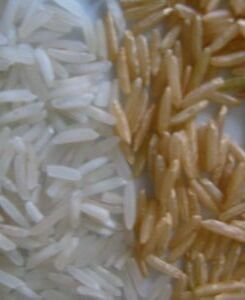 Rice that has been stripped down until there’s nothing left but the white carbohydrate part? Or are we talking about whole grains like whole wheat, brown rice, whole barley or whole oats that are called “complex carbohydrates,” act nothing like refined carbohydrates when you eat them, and used to be staple food all over the world? The third basic concept (and this is closely related to the second concept) is that no matter what type of food you decide you should eat, choose the highest quality of that food that you can. “Quality” is relative, certainly. But this is where you should look into what it means for food to be organic and why that is important. And why your food should not be genetically modified. The subject of food quality is worth learning about because it is key to understanding how what you eat will affect your health and how you live. I encourage you to gain that understanding and get into the drivers seat of deciding what effects you will create for yourself and your family with your food and don’t just leave it up to the “chefs” at the local fast food place or your favorite chain restaurant or the marketing directors of food manufacturing companies. But take heart and just start finding out. Find out about organic food. Check out the subject of “whole food.” And if you can confront the political/economic realities, find out about GMO’s (genetically modified organisms). Following the three basic concepts I gave you will take you a long way toward understanding what’s good enough to eat. All of which brings me to a YouTube I saw recently. It is a video of an eleven-year-old boy explaining why he is going to be an organic farmer instead of an NFL football player. It’s excellent because he is passionate and confident and his presentation makes the subject so easy to grasp. Takes me back to my United Farm Worker days . .
Let me know what progress you have made on these basic concepts! This entry was posted in Cooking, Food and tagged diets, food choices, GMOs, health, macrobiotics, organic food, social change, Sugar Blues by mycookinglifebypatty. Bookmark the permalink. That’s wonderful for a Mom to hear! Brilliant! Feels good to know that you are informing people on this very important issue. Thank you.